Pinnacle Graduate Erin Hodge | The Pinnacle P.O.V. Erin at her desk in the Casa Grande Chamber of Commerce. Before Erin Hodge became an eager, bright-eyed teenager, she was well accustomed to the whirlwind that goes with having to switch to a new school. She spent most of her childhood shuffling back and forth between several public and private schools in search of the best solution that fit her academic and personal needs. But when Erin was about to enter ninth grade, her mother approached her with some interesting news. Her mom was hired for a new job in Casa Grande, AZ and Erin would have to transfer to a new school, again. As a teenager, uprooting your life to a new school once can be quite overwhelming, let alone numerous times. From making new friends, to acclimating to a new environment, there are many things that go through a teenager’s mind during this complex transition. But this time it appeared Erin and her mother finally found the school solution they were looking for. In an effort to help stabilize her daughter’s new school endeavor, Erin’s mother enrolled her in classes with Pinnacle Education. Erin said her mom chose Pinnacle because she wanted to give her an alternative to the traditional brick-and-mortar high school. In previous years, Erin’s mother enrolled her in public, private and charter schools, but was unsatisfied with her daughter’s academic success and opportunities. Pinnacle Education was founded in 1995 and allows students to complete their courses via their online high school. The school provides computer-assisted instruction with social skill training and workplace development as students attend class for a few hours a day in a computer lab and receive assistance from lab instructors who monitor their progress while in the lab. This new way of online learning was a big difference compared to what Erin was accustomed to, but she took it in stride. So Erin took her classes at Pinnacle during one of the four-hour daily sessions at the school and received continuous support from her lab managers. While the lab managers didn’t teach the courses themselves, they helped students like Erin by monitoring their work and progress in the courses and helped them communicate with their online school instructors. When asked what the best benefit of the program was, Erin commented on the schedule and curriculum. While taking classes at Pinnacle, perhaps the biggest surprise to Erin was the quality and detail of the course curriculum. She said the content in her classes were challenging and very informative. Erin continued and finished her high school career with Pinnacle and graduated just before turning 17. The Pinnacle courses and schedule gave her a chance to graduate and enter college early, and her good grades helped her earn a scholarship to Central Arizona College. 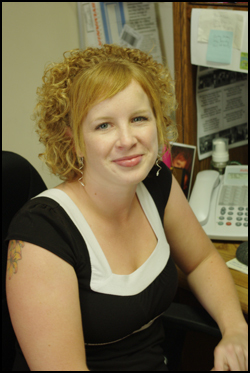 After college, Erin took a job in the Membership Sales department for the Casa Grande Chamber of Commerce. She is responsible for contacting residents and local businesses in Casa Grande and asks them to sign up for chamber memberships. Once they join the chamber, Erin helps coordinate member events and activities, as well as assist the members in expanding their reach in the community. And Erin said she is enjoying every minute of it. As Erin looked back on where she started and sees where she is today, she said she has many people to thank. And one particular group of people she said that helped her a lot along the way was the teachers and staff at Pinnacle Education. Watch the clip below to view the video interview of Erin. ~ by pinnaclepov2224 on October 8, 2009. Thanks again for all your help Erin. We really appreciate it!